NP_Truck-Cab-2web – HMD Trucking, Inc. Copyright © 2017, HMD Trucking, Inc.
HMD TRUCKING INC (“HMDTRUCKING.COM”) takes your privacy seriously. We want you to know how we collect, use, share, and protect your personal information. We collect personal information that you voluntarily share with us through the Site. For example, we collect information from you when you fill out an application or fill in onboarding orientation forms on the Site. We collect information through technology to enhance our ability to serve you. When you access and use the Site, HMD TRUCKING INC collects information about how you interact with the Site. We describe below a few of the methods we use to collect information through technology. When you visit the Site, we collect your device identifier, browser information, and Internet Protocol (IP) address. An IP address is often associated with the portal you used to enter the Internet, like your Internet service provider (ISP), company, or association. While an IP address may reveal your ISP or geographic area, we cannot determine your identity solely based upon your IP address. We may also collect information about how you use the Site, such as the amount of time you spend using the Site, how many times you use a specific feature of the Site over a given time period, how often you use the Site, and actions you take in the Site (collectively “Site Usage Information”). We may link your Site Usage Information to personal information you have provided us, in which case we will treat the combined information as personal information. Yes. Cookies are small files that a website or its service provider transfers to your computer’s hard drive through your Web browser that enables the website’s or service provider’s systems to recognize your browser and capture and remember certain information. For example, after you have authenticated your identity on the Site by entering your name and other identifiable information, a cookie remembers you as you move from page to page in the Site. A cookie also remembers what link you clicked to come to the Site. If you prefer, you can choose to have your computer warn you each time a cookie is being sent, or you can choose to turn off cookies by adjusting your browser settings. Like most websites, if you turn your cookies off, some of the features on the Site may not function properly. The Do Not Track (DNT) browser setting is a preference you can set in your browser’s settings that signals to websites that you visit that you do not want to have your online activity tracked. Many websites and applications, including our Site, do not currently respond to web browser DNT signals because such signals are not yet uniform. For more information about DNT signals, please visit http://allaboutdnt.com. We will retain your personal information 36 months or until you request that we delete it as described in the “Your Choices Regarding Personal Information We Collect” section below. Site Hosting Provider: As noted above, the Site is hosted by Tenstreet. Application and Onboarding Process: We may disclose your personal information to a third party service provider for the purposes of a background check, or other application and onboarding services. Data Analytics: We may retain third-party service providers to help us perform data analytics regarding your interactions with the Site. Legal Compliance and Protections: We may disclose account and other personal information when we believe disclosure is necessary to comply with the law or to protect the rights, property, or safety of HMD TRUCKING INC, our users, or others. This includes exchanging personal information with other companies and organizations for fraud protection and credit risk reduction. To a subsequent owner, co-owner, or operator of the Site or successor database. In connection with a corporate merger, consolidation, the sale of substantially all of our membership interests and/or assets or other corporate change, including to any prospective purchasers. We do not collect any information from anyone under 13 years of age. The Site is directed to people who are at least 13 years old or older. If you are under the age of 13, you are not authorized to use the Site. It is important for you to protect against unauthorized access to your computer and other devices you used to access the Site. Be sure to close your browser after you have completed your visit to the Site. 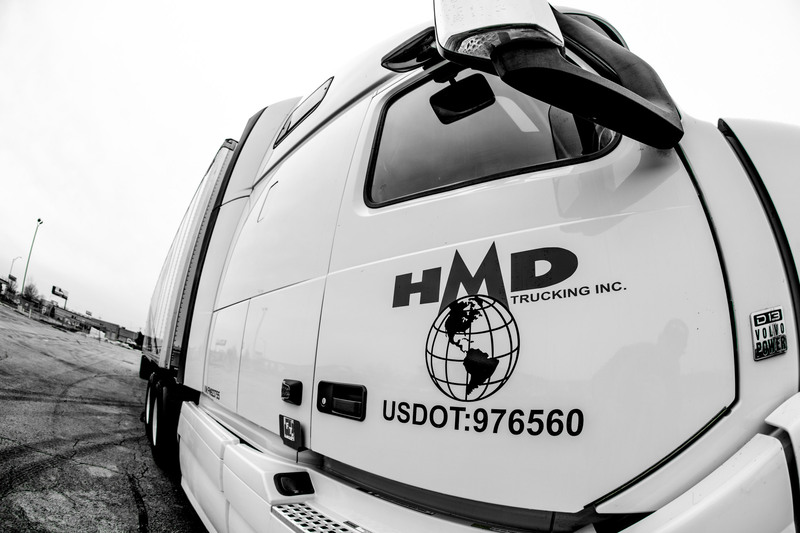 You may contact us at contact@hmdtrucking.com to correct or delete your personal information.